Screw Kimmel and Daly. The best Late Show going will be October 15th at Mercury Lounge as the HHK Crew brings NYC's most popular hip-hop event back to the Lower East Side. Don't forget to check out our song list, which has a bunch of new songs and if you're not following us on Twitter, what are you waiting for? See you there. But. . . the new songs aren't listed on the songs link, and the two "Recent Photos" links are not working. Can't wait! It's been waaay too many a minute. How late will this show be going until? as late as it needs to, homey! That's what I'm talkin' bout!!! that link is to the main gallery -- which pic are you talkin bout? 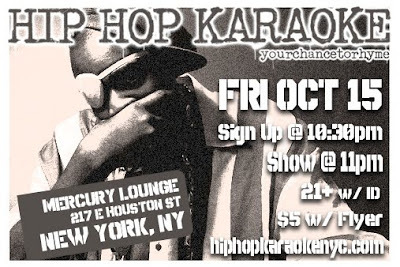 It looks like that Hip Hop Karaoke blog will be a good source of ideas for my new pages bellow. I am not very good in hip hop scene and it is good to know it. What's going on with the pic page? it's just that the link on the blog is effed up. you can still click "photos" and get there. If I may pre-empt Josh, that show was "bananas." Have there always been so many crazy performers, and I just never noticed because I was drinking way more? Good times. Another crazy night indeed! Can't wait to see all the pics!